More than 300 FAG spherical roller bearings from Schaeffler (UK) Ltd are providing support for a new retractable roof at Wimbledon's Centre Court. More than 300 spherical roller bearings from Schaeffler UK are playing a vital role in supporting a new retractable roof over the Centre Court, Wimbledon. The roof is designed to open and close in less than 10 minutes and will be unveiled for the first time at the Wimbledon Tennis Championships in June 2009. The roof will enable a consistent and safe (non-slippery) playing surface to be maintained in both open and closed positions. The translucent roof allows a high percentage of natural light to reach the grass when in the closed position and offers protection to the grass under all adverse weather conditions. The roof itself is of a 'folding fabric concertina' design, enabling it to be folded into a highly compressed area when not in use over the court. The roof is translucent enough to provide an 'open' feel even when the roof is closed. The fabric, 5,200 square metres of it in total, is a specially developed waterproof structural material that is extremely strong, and also highly flexible. A key element of the roof design is that it allows a very high proportion of natural light to reach the grass when the roof is closed. An airflow system removes condensation from within the enclosed space to provide an optimum internal environment for the comfort of both spectators and players. The retractable roof is divided into two sections, with a total of nine bays of structural fabric - four bays in one section and five in the other. Each of the nine bays of fabric is clamped on either side by prismatic steel trusses. There are 10 trusses in total that span approximately 77 metres across the court. The ends of each truss are supported by a set of wheels that move along a track positioned on each side of Centre Court. In preparation for closing the retractable roof, one section is parked in its folded state at the North end of the court, while the other is parked at the South end. To guarantee precise movement of the roof, a combination of high precision electric actuators, servomotors and arms was required. This system moves the trusses apart, while simultaneously unfolding and stretching out the fabric over and between the trusses over the court, until the two sections meet in an overlapping seam above the middle of the court. At the end of the trusses, lie components that look rather like enormous hinges. Schaeffler's FAG spherical roller bearings are incorporated into these hinges. These bearings were selected for their low frictional resistance and ability to accommodate large misalignments. 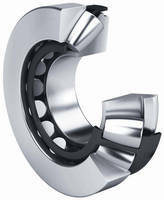 The bearings are lubricated with high performance grease and will require minimal maintenance during their service life. In total, Schaeffler supplied more than 300 bearings for the project. These bearings were a mixture of spherical roller bearings to support the radial loads in the hinges at the ends of the roof arches and spherical roller thrust bearings, which support the axial loads imposed by the tensioning cables that stretch across the roof. The largest spherical roller bearing supplied, which is primarily used in the hinged joints at the ends of the supporting arches has an outside diameter of 200mm and carries radial loads in the order of 300kN (30 tonnes). The spherical roller thrust bearings carry the large axial loads, approximately 600kN (60 tonnes), imposed by the tensioning cable, which are required to provide both strength to the arch and tension for the fabric roof material. As the bearings are completely sealed within the hinge members, they are not exposed to external weather conditions. This meant that Schaeffler could select bearings from its standard range, which offered both ease of use and supply. The bearings were filled with high quality lubricating grease. The arched shape of the tops of the trusses helps the structure to withstand loading from the elements such as wind rain and snow when the roof is stretched and closed over the Centre Court. Derek Peasley, Product Support Engineer at Schaeffler UK, who has worked closely with engineers at Street CraneXpress, commented: "We have enjoyed working with Street CraneXpress on this prestigious project. We were impressed with their professional approach at all stages of the design process and are confident that the bearings selected will perform well in this demanding application." Schaeffler UK worked very closely with its customer Street CraneXpress Ltd, a specialist mechanical handling company based in Sheffield, for the selection of suitable rolling element bearings to be incorporated in the folding hinge supports. Street CraneXpress is responsible for the design, manufacture, and installation of all of the mechanical and electrical components used in the retractable roof. Daniel Salthouse, Project Manager at Street CraneXpress has worked on the Wimbledon Roof Project for more than five years. He comments: "In the past, we've used bearings from other bearing suppliers. However, for this project, we decided to work with Schaeffler UK because we were won over by the company's excellent technical support and bearing expertise in selecting and supplying bearings for bespoke construction projects, such as The London Eye and the new Wembley Stadium Arch. The company's pricing was also very competitive." "With 15,000 people sitting within the Centre Court area, and with the possibility of unpredictable wind and weather conditions, the bearings are critical in supporting the retractable roof. Safety, reliability and low maintenance requirements were therefore all critical for this project. The bearings have a life of between 20 and 25 years and are grease lubricated for ease of maintenance and a long service life," adds Salthouse. According to Salthouse, a typical example of the type of technical support offered by Schaeffler UK was with the bearing mounting instructions. "Schaeffler UK engineers offered complete advice and instructions, which helped speed up the assembly process considerably," says Salthouse. For more information on Schaeffler's range of spherical roller bearings, please visit www.schaeffler.co.uk or telephone the marketing department on: 0121 351 3833. With a total of 66,000 employees at over 180 locations around the globe and group sales of 8.9 billion Euros (fiscal year 2008), the Schaeffler Group is one of the world's leading rolling bearing manufacturers and automotive component suppliers. The corporate group includes the INA Group with headquarters in Herzogenaurach, the FAG Group based in Schweinfurt as well as the LuK Group, with headquarters in Bühl.